Listed below are tips for caring for your instrument and bow, a list of reasons why strings break, and some quick-fix suggestions in the event of a musical emergency. Protection: Always keep the instrument and bow in the case (or cover/bag) when not in use to prevent accidental damage. Cleaning: Wipe the rosin dust from all surfaces with a clean cloth after each use to avoid buildup. Do not use alcohol to clean the strings or varnished surface as this may remove or damage the finish. Oil based polishes should be used only sparingly and only if there are no open edges or cracks the polish could penetrate. Wax-based polishes are gentle and can be reversed. We recommend using separate cleaners and polishes to avoid polishing over existing dirt. The Bridge: The bridge should remain with the back of the bridge (the side facing the tailpiece and furthest from the fingerboard) is perpendicular to the top of the instrument. Tuning at either end of the string (consistently at the pegs or fine tuners) tends to pull the bridge and, if not re-adjusted regularly, can cause permanent warping. If not frequently straightened, the bridge can warp so severely that the bridge can snap and the force in the collapse of a bridge can damage the top of the instrument. Ask your teacher or repairman for assistance if you are uncomfortable making this adjustment. You may notice changes in the string height on your instrument (this may be even more obvious in higher positions) as the seasons change. In humid summer months, the top (and other portions) of the instrument absorbs moisture--this swell can cause the bridge to raise and the strings to be too high off of the fingerboard. During winter months when humidity levels are lower, the top of the instrument can lose moisture--this drop in humidity can cause the bridge to lower and the strings to be too close to the fingerboard. In some cases it may be necessary to have two bridges (this is especially true for cellos which change more dramatically during the seasons); one low bridge for the summer and a higher bridge for the winter. The bridge should also have some protection (either a bridge cap or a string protector) on the highest string to keep the string from cutting down into the bridge over time. If you are using steel strings: place the ball end of the string into the tuner, then put the other end of the string through the hole in the peg and turn the peg so that the string winds over the peg and toward the handle part of the peg--it should not be forced against the peg box wall. Only stick a small part of the string (approx. 1/4") through the peg. 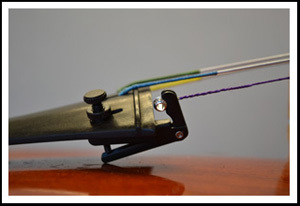 If using a synthetic gut string: when installing on fine tuners (like the one pictured below), put the peg end of the string through the ball end of the string (forming a lasso) and put this lasso around the prongs of the tuner. This will prevent the breakage of strings at the tuner; lassoing the string is not necessary on most violin E strings or steel A, D, G, and C strings. Continue as above with the installation at the peg end. It is always a good idea to put graphite (pencil lead) in the top nut groove when changing strings to aid in the smooth passing of the string over the nut. Tuners: Fully-extended fine tuners can seriously damage the wood or varnish (see image to the left). Guard against tuners touching the top of the instrument by checking the bottom of the tuner frequently. When the underside of the tuner becomes close to the top of the instrument, loosen the tuner screw just until the screw is able to raise or lower the pitch of the string when turned slightly to the left or right. After the screw is loosened, use the peg to tune the string back up to the correct pitch. Make sure the tuner screw or nut doesn't become too loose or it may buzz/rattle (see the section on buzzing in the emergency repair section). Pegs: Normal tuning can cause pegs and peg holes to compress and go out-of-round. Out-of-round pegs are a common cause for slipping and should be fixed by a repairman. Additionally, pegs are sensitive to changes in humidity and may require extra attention in winter and summer months. In winter months, pegs can dry out which causes slipping. In summer months, pegs can swell which causes sticking or jammed pegs. Dry, slipping or sticking pegs can usually be corrected by applying a thin line of "LAVA" bar soap where the peg makes contact in the peg box. We do not recommend chalk or peg drops pegs because they can cause the peg to jam or freeze in place and, when an inexperienced person attempts to free the peg, permanent damage to the peg box is possible. If you are ever unable to free a peg from the peg box by simply turning the peg by hand, do not attempt to force the peg--take the instrument to an experienced repairman. Stuck pegs are a quick adjustment which can be done while you wait and the adjustment is typically free at Lashof Violins. The majority of broken pegs brought to our store for replacement were broken when too much force was applied to the peg. The amount of time (and cost) for a repairman to free the peg is negligible when compared to the amount of time and money it may take to replace the peg or repair the scroll or peg box. Remember: Pegs & Pliers Do Not Mix!! Click here to learn more about slipping pegs. Cracks & Open Seams: Check your instrument regularly for cracks and open seams. In any quality of instrument, excessive dryness can cause both cracks and open seams, so humidify your instrument with an instrument humidifier and, if possible, a case humidifier. Humidification is especially important in the winter when the heat in your home will dry out the air. Have your repairmen glue open seams and cracks as soon as possible so they do not get worse. Do not apply cleaner or to polish an instrument that has open cracks or seams as this may make any future repairs very difficult. 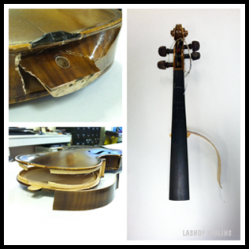 Lashof Violins checks instruments for open seams and cracks at no charge to the customer. The Soundpost:The soundpost is the heart and soul of the instrument and must be adjusted as the instrument changes with weather conditions. 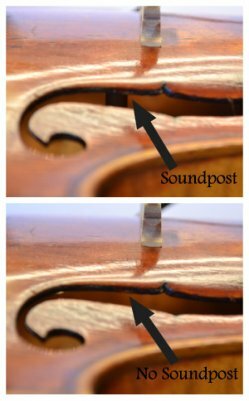 It is not recommended the musician attempt to adjust their own soundpost- an inexperienced hand can cause serious damage to the inside and top of the instrument (Lashof Violins offers soundpost resetting as a free service). Always release the tension of the strings if the soundpost falls and bring to a repairman for adjustment (see image to the left). The Bow:The bow hair should always be loosened after each use to preserve the proper sweep and straightness of the stick. As with the strings, the hair should be changed approximately every 6 months. As hair gets old, it stops producing a clear, resonant tone. Hair may also stretch or shrink with the weather. In the winter, the hair can also dry out and shrink due to too little humidity. Bow hair left tightened in extreme weather (cold, humidity below 40%, etc.) can shrink so dramatically that the bow may be permanently damaged. Protect your instrument and bow, humidify your case and its contents.